We have spent the last couple of weeks alternating between snow days and sunny 45 degree days. The warm sunny days make me start itching for spring, but I know that the night time temperatures will regularly drop below freezing until early May. So I consoled myself with the impulse purchase of two 3 foot high rosemary plants (on sale for $6.99 each at my local grocery store). It might be winter outside, but my kitchen smells like spring! 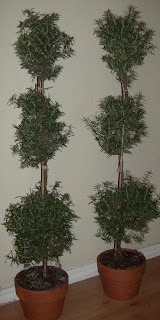 Since rosemary does not do well in zone 4 winters, I will be keeping the plants inside until all danger of frost has passed. Before I move them outside, I will transplant them into a larger, bottom heavy pot and pray that they are not bashed about too much by the wind. I have taken advantage of having fresh herbs in my kitchen, using the rosemary in roasted sweet potatoes and baked salmon. I double the amount of fresh herbs in recipes that call for dried herbs. I am really enjoying having usable plants in the house. Did you have the forsight to bring in some herbs for the winter? I know that next winter, I will be sure to bring in enough for a window garden! To see what other gardeners are growing, visit Fertilizer Friday. WOW! Great plants at a great price! I love using herbs in cooking too. Luckily my winters aren't harsh enough to kill them. awesome!!! those are fabulous! thanks for linking in to FF with me...I can't wait to see them growing!! Ohhh... I bet they smell great.